The Old Town Hall building at 30 Main Street in Ipswich is listed in the National Register of Historic Places as part of the South Green National Historic District (9/17/1980). For 180 years the massive Greek Revival building has stood at the corner of Elm Street and South Main Street. The Unitarian Church built it in 1833 but sold it to the town ten years later to be used as town hall and a social gathering place. It was more recently used as the District Court and now houses condominiums. Ceiling in the Old Town Hall. During the years the building was used as a District Court and Town Hall, suspended ceiling panels hid this view. 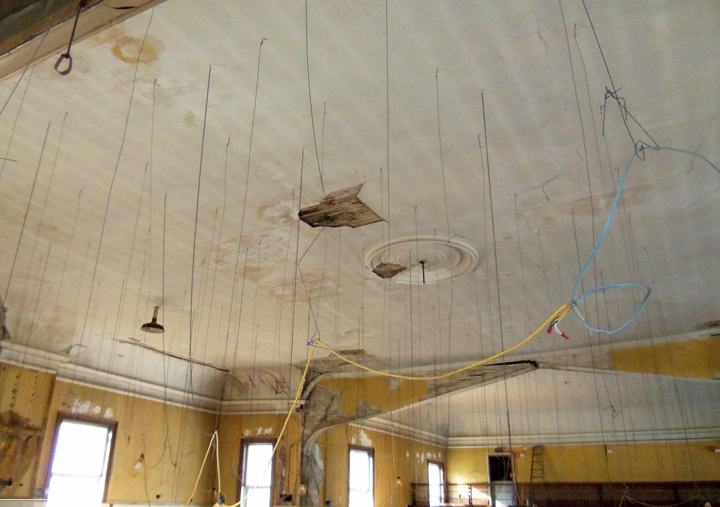 Water and age-related damage to the ceiling and plaster medallion were easily visible. 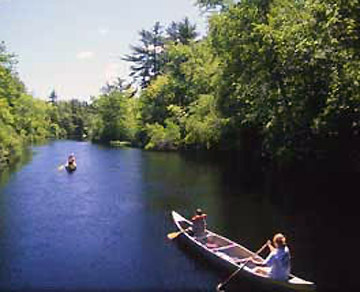 Preservation Restriction (10/16/2006): The Town of Ipswich through the Ipswich Historical Commission holds a preservation restriction on this property, conveyed by Ipswich RE Holdings LLC at the time of sale of the property by the town. An original copy is on file with the Ipswich Selectmen’s office. 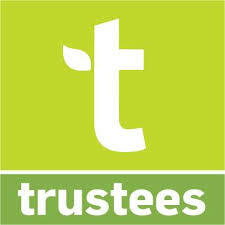 The building is protected by these agreements in perpetuity. The Historical Commission under the Historic Buildings Demolition Delay law has a mandate to preserve historical structures and is authorized to make a determination that an owner has failed to secure a preferably preserved significant building. 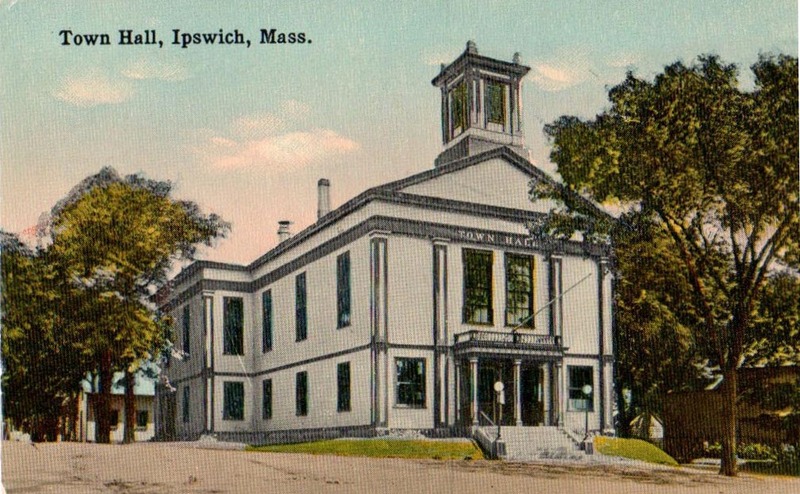 A few years after the Town of Ipswich purchased the building from the Unitarian Church, the structure was raised and a new first floor was added below it. In April of 1830, fourteen members of the First Church in Ipswich withdrew from the parish to form “The Independent Congregational Society” or Unitarian Church. Historian Thomas Franklin Waters tells us that the new church prospered, so much so that by 1833 the parishioners were able to build a brand new state-of-the-art church in Ipswich along South Main Street, at the corner of Elm Street. The Unitarians must have been forward thinkers architecturally as well as religiously, because they built the first Greek Revival public building in Ipswich. That church building still exists, hidden inside the much larger Old Town Hall. As such, it is the oldest church in Ipswich, pre-dating the CA 1848 Linebrook Church. The Unitarian Church was about sixty-three feet long by about forty-four feet wide. Three very tall shuttered windows marched along each side of the story-and-a-half church, which presented a temple front to South Main Street with a deep frieze band at the cornice. The corners of the building were protected by free-standing boxed pilasters that supported the frieze, while a pair of fluted Doric columns flanked the central opening into the recessed entry. Above the gabled roof peak a belfry gave the building some much-needed height and called the faithful to worship. The Old Town Hall at first kept the bell tower from the Unitarian Church. While the Unitarian Church began its life with great energy in Ipswich (and may well have served as inspiration architecturally for the South Parish which undertook a building campaign in 1838) it could not sustain itself. By 1843 the Unitarian Church was no more, and it sold its church building to the Town of Ipswich. The church pews were removed and sold to the Linebrook Church, where they are still installed. Waters wrote of the new Town Hall that, “It was greatly enlarged and remodeled for the Town’s use.” If so, it was certainly not for the last time. By 1866 the old Unitarian Church seemed to be inadequate for the needs of the townspeople for a social gathering place, in addition to town office space. The Town acquired more land adjacent to its existing site in 1866, but failed to move or improve the old building until matters came to a head in 1876. The Old Town Hall, about 1950. 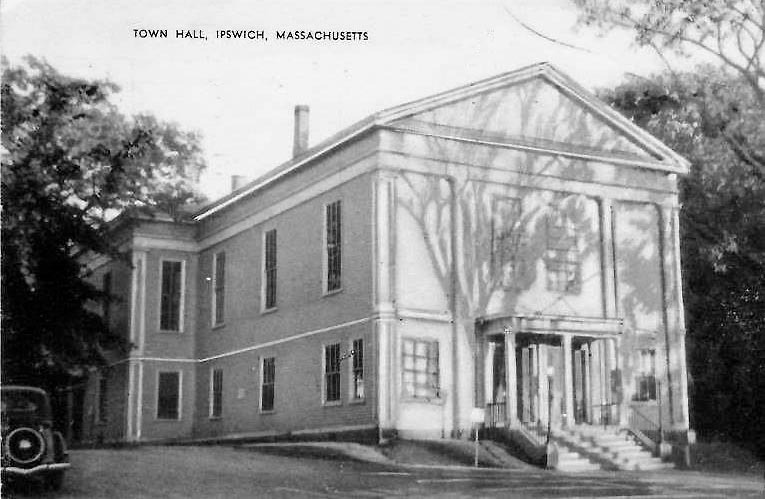 Keenan reports that in an adjourned Town Meeting of 1876, the young “progressives” sought to demolish the old Town Hall and build a new one for $10,000. 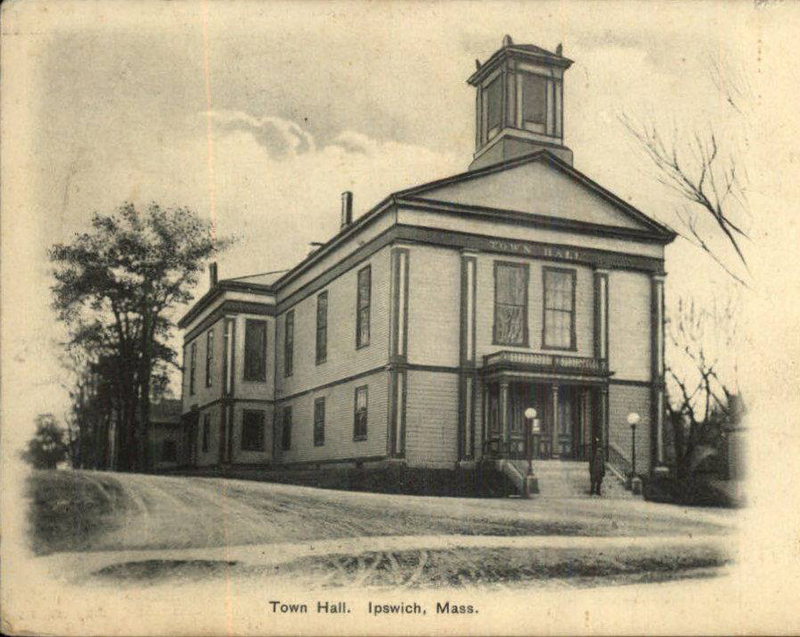 Instead they got snookered by a series of wily political moves on Town Meeting floor and, “the voters were surprised to discover the next day that they had voted, without discussion, to enlarge, move, and repair the old Town Hall for the sum of $6,000. ”The contract to move and enlarge the Town Hall was awarded to the firm of Russell and Archer, and the Hall was moved twenty feet forward, the entirety of the old Town Hall building raised in the air, and a new first floor placed beneath it. In addition, a large addition was added to the rear (east) of the building. The building today retains this 1876 form, except for the section that housed the General Sutton Hook and Ladder Fire Company. 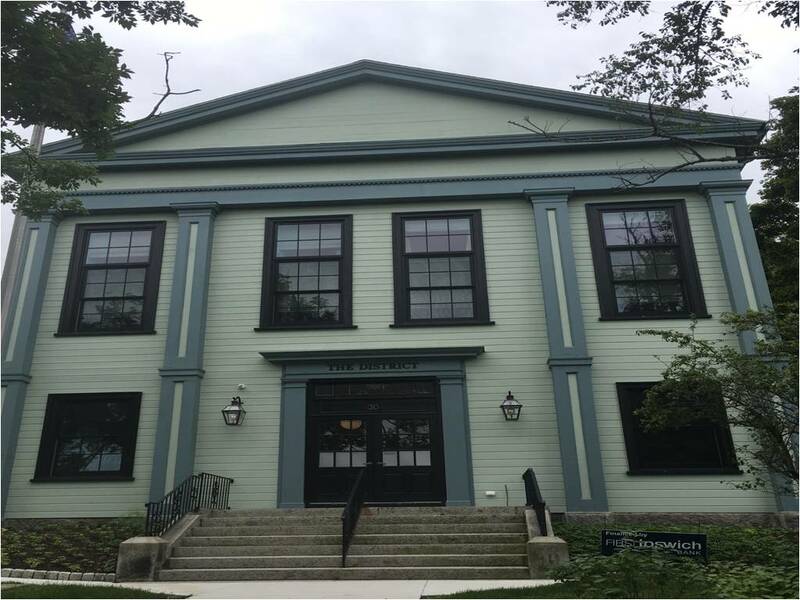 On the exterior, the Doric columns were removed from the front facade, and replaced with a pair of double-hung windows, and the recessed entry was thus enclosed, creating a flat front facade. The four boxed pilasters were retained, and were copied on the new first floor addition. A belt course band was added where the new first floor joined the old church/Town Hall, to disguise and decorate the joint. A 1906 postcard shows the addition of a columned portico to shade the entry. On the inside of the building, the changes were even more dramatic. A new court room and town offices were installed and a second floor auditorium was created, seating 800 on the main level with another 100 in the balcony. The stage was forty-four feet wide with two dressing rooms. Local historian Harold D. Bowen reported that on October 9, 1920 a fire at the Town Hall threatened to destroy the building but was confined to the lower level, with losses set at $8200, a significant amount for 1920. 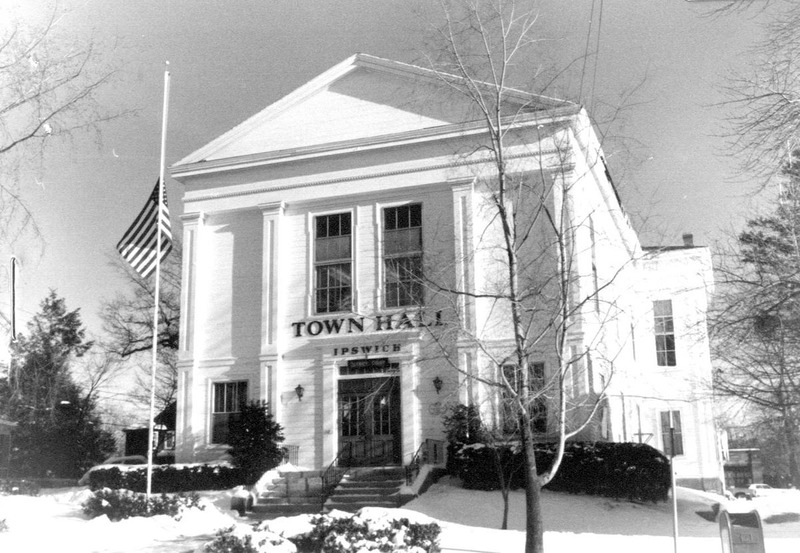 A dire need for new office space led Town Manager George Howe to hire the firm of Anderson Nichols to oversee extensive renovations to Town Hall between 1983-84. The old front entry to Town Hall on the South Main Street side with its wide central stair and second floor balcony was demolished and enclosed to create additional second floor space and an elevator for handicap accessibility. The first floor was thus reconfigured to create a smaller single story front lobby and one large office in the front southwest corner of the building. At this time the second floor was partitioned, a staircase to the balcony was removed and replaced with a metal spiral stair, and an elevator shaft was installed adjacent to the other staircase, effectively blocking it for access into the balcony area. A dropped ceiling was installed over the auditorium to close off the balcony area and create lower more sound proof and heat efficient offices on the second floor. This effectively disguised the original form of the auditorium space. There were no substantive changes to the Old Town Hall since its last major renovation in the 1980’s, until the walls were stripped by the owners in 2007. In 2016 the Old Town Hall was purchased for conversion to a condominium. I loved reading your history!